Here is a bear bringing smiles for St. Patty's Day. I made him from the Cricut Bear on Parade cartridge. He is also on an action wobble from Scrapbooking Queen at http://www.action-wobbles.com/ I embossed his jacket with the cuttlebug swiss dots embossing folder. The card is 5.50 x 4.25" embossed with the cuttlebug baby breath folder. The shamrock ribbon was actually a shoelace I found at Joann Fabric. The diecut and sentiment is from My Creative Time. http://www.creativetimeforme.com/ I used memento ink cottage ivy for the sentiment. I used a gel glitter pen for the pot of gold, tie, shoes, hatband and shamrock edge. The shamrock was cut at 1" from Cricut cartridge A Child's Year. Your Irish bear is so cute and fabulous! Thanks for joining us at BBTB2. 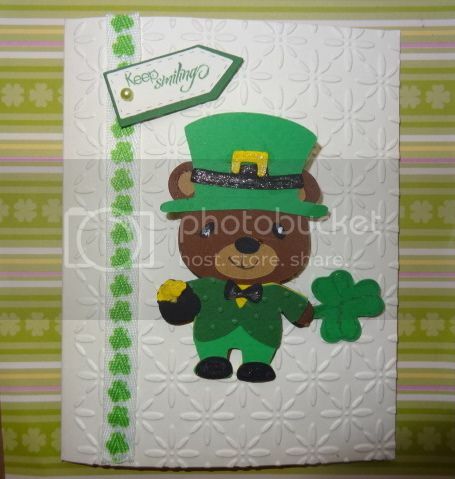 Wonderful St. Patrick's Day card! 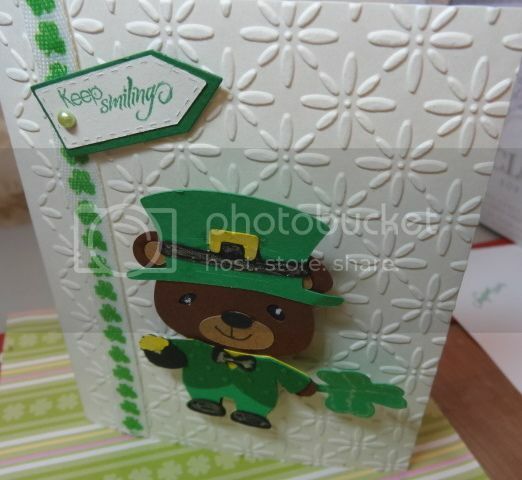 Your Irish bear is so cute - love the facial expression. Thanks for joining us at BBTB2 this week. I love your cute little bear and the shoelace is absolutely perfect. The embossing on your card goes so well with your theme. Thanks for sharing at bbtb2. Adorable. What a cute image and I love the embossing. Thanks for joining us over at Paper Playtime. I love that bear so cute. Thanks for playing along at Paper Playtime. Sweet Irish bear. Love the embossed background as well. Thanks for joining us at Scrappy Frogs. An adorable card, a lovely design and stunning embossing. Your bear with his shamrock is a real cutie!! I so love your cute little Irish bear and his outfit. Thanks for joining us at My Paper Crafting. super cute! thanks for playing the pink elephant! I love your card and thanks for joining us at Exploring Cricut.